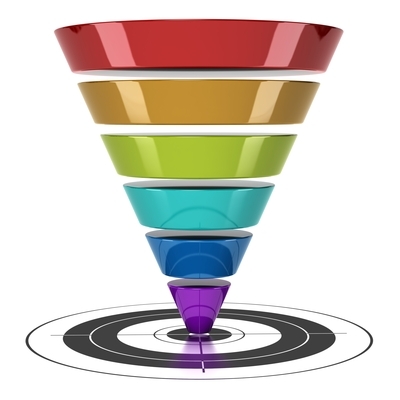 Sales and marketing experts know that the sales process includes a multitude of stages – steps that a purchaser normally experiences before making a decision to buy. As our trial consultants see it, litigators also need to “sell” the judge or jury on the correctness of their client’s position. Therefore, it stands to reason that trial lawyers can learn a good deal from salespeople. All the way back in 1898, the sales process was defined by E. St. Elmo Lewis as having four steps ---Attention (get the attention of your prospect), Interest (raise his or her interest), Desire (build desire in the mind of the prospect) and Action (get him or her to act or purchase). The AIDA model was shared with a much wider audience in the film Glengarry Glen Ross. Even now, 114 years later, most modern sales theorists have only modified this sales methodology slightly. In litigation, a judge or jury has to go through several stages before making a decision in your client's favor. Trial consultants focused on jury decision-making theory have developed a number of models to understand the process. Most of our trial consultants subscribe to the Pennington and Hastie story model, which posits that jurors will construct a story that makes sense to them. As the case unfolds, jurors pass through three stages: (1) building a story; (2) learning how they must formally render the verdict; and 3) applying the story to that verdict structure. 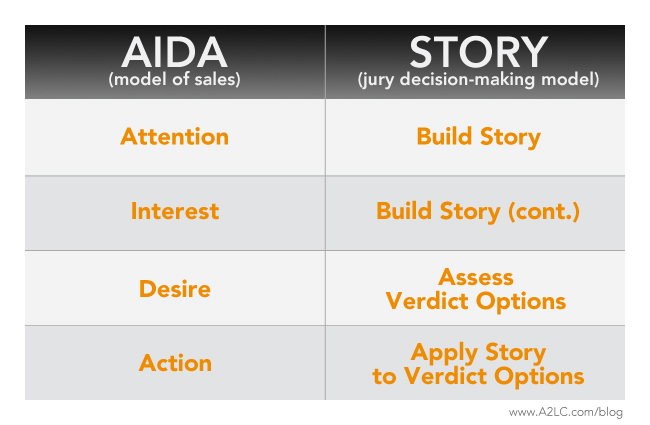 Now, taking a look at the chart below aligning sales stages with jury decision making stages, you'll surely notice the similarities. So, if there are similarities, what can we as litigators learn from the sales process? Our trial consultants believe that there are a number of valuable strategies, but let's look at six key sales messages in these sales training videos. 1. Getting attention: The truth is, jurors will give it to you until you lose it. Our trial consultants find that most jurors take their jobs seriously. To keep their attention, convey what is at stake in a compelling way. Might a wrong go unpunished? Might an American institution get picked apart wrongfully? Is this just Monday-morning quarterbacking motivated by money? You get the idea, and certainly Alec Baldwin masters getting attention in Glengarry Glen Ross while talking about the AIDA model. 2. Getting interest: This sales trainer points out a critical aspect of sales: fear of loss is a greater motivator for decision-making than hope of gain. Sell for or against liability on a fear of loss. Sell for or against damages the same way. Our trial consultants encourage the framing of a case using these neuromarketing techniques. 3. Build trust: Convey to your jury that you trust them and they will trust you. Therefore, our trial consultants urge you to talk to them about not only the responsibility they have been entrusted with, but more importantly, to authentically convey that you trust them to do the right thing. 4. Build rapport: Salespeople are taught not to sell until a connection is established with the prospect. This video is especially useful for voir dire in jurisdictions that have it. 5. Close the sale (even when you can't ask questions): A2L Consulting's trial consultants remind that just like a salesperson must tell great stories when closing the deal (see also our article on storytelling for litigators), trial attorneys should do the same. 6. Don't forget to ask for the business (i.e, the verdict and damages figure): Most trial consultants will report that during mock excercises, mock jurors almost always start with the figures given to them when damages are discussed. Do not forget to ask for a damages number whether the right answer is $15 billion or $0. Just as the measure of a great salesperson is closing more deals and generating more revenue, the measure of a great litigator is winning more cases and achieving ideal damages outcomes. Just as in sales, in trial you should Always Be Closing – feed the jury the story and themes throughout your case to help the jurors adopt them as their own – don’t force them to concoct their own versions of the facts. If you’ve set yourself up with a proper and persuasive story and themes, you’ll be standing on solid ground when you tell the jurors how to fill out the damages line in their verdict form.